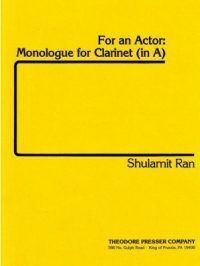 Part 2 of my Spotlight series on solo clarinet works by women composers takes a look at For an Actor: Monologue for Clarinet, by Shulamit Ran. Immediately, For an Actor is set apart from most solo clarinet repertoire due to its instrumentation – Ran calls for the instrument in A, rather than the much more common B-flat clarinet. On a side note – I love playing the A clarinet, and I wish it would be called for more frequently by contemporary composers. 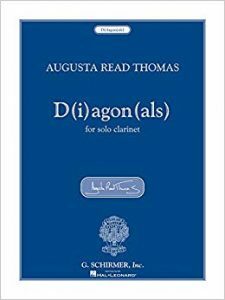 While some composers allow either, such as in Augusta Read Thomas’s D(i)agon(als), few ask for it specifically. To my ear, Ran’s choice gives the piece a slightly darker tone than it would otherwise have. On November 30 at Bread and Salt in San Diego, I’ll be performing a concert as part of Figmentum. 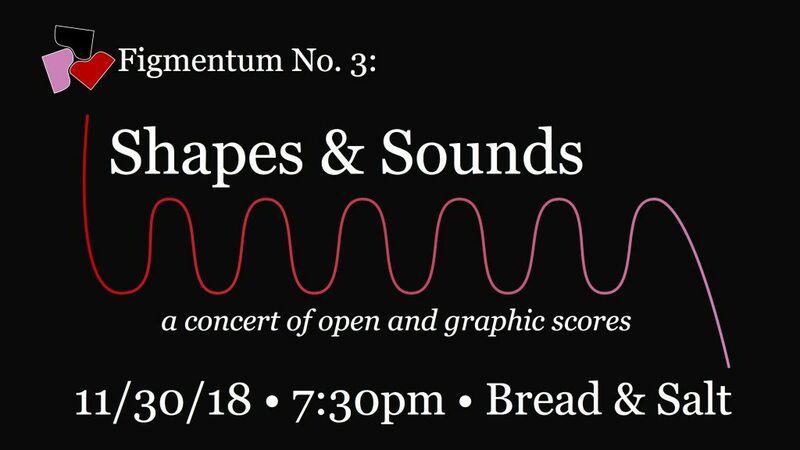 Titled “Shapes and Sounds”, we’ll be presenting several open and graphic scores as well as premiering a new piece by Daniel Meyer-O’Keeffe. You can check out the full details at the Facebook event here, or at the Eventbrite listing here. The program will kick off with my piece Wanderings (B), a score for any number of performers (though it seems like it would work best with small chamber set ups – we’ll be performing it on three toy pianos surrounding the audience). This is the first in a series of spotlight posts on solo clarinet repertoire composed by women. Up first, Augusta Read Thomas’ D(i)agon(als). D(i)agon(als) was commissioned in honor of clarinetist Russell Dagon in 2005, and premiered at Northwestern by J. Lawrie Bloom in May of that year. The piece is a tight five minutes of playful and improvisational-sounding material, with a wide range of characters in its short duration. It’s as fun to play as it is to listen to. Structurally it consists of five sections of increasing length, described by Thomas as “phrases”. Indeed, there is little that could be heard of as cadential until the fermatas that punctuate the ending of each phrase, making part of the challenge of the piece giving each of the lengthy phrases shape and direction. The other challenge of the piece is in the idiomatic yet virtuosic writing for the clarinet – everything lies under the fingers quite nicely, but there are some difficult passages around the break. The piece also demands great control and flexibility, as Thomas tasks the clarinetist with sudden changes in register, dynamic, and mood throughout the piece. Pedagogically, this piece is a good early step into contemporary clarinet repertoire for an advanced student with a solid altissimo, as its virtuosity is in conventional technique, with nothing that would be considered an extended technique. The wide leaps are helpful in developing the registral flexibility necessary for many contemporary works, but in a manageable package that is not a test of endurance. Purchase D(i)agon(als) on JW Pepper. I am honored to have been selected to perform at the 2019 Music By Women Festival, hosted by the Mississippi University for Women from March 7-9 of next year. Founded by Dr. Julia Mortyakova, this is the festival’s third year presenting music composed by women composers past and present. I’ll be performing a solo clarinet set including Sonorous Body by Liza Lim and a new piece that Ania Sundstrom is writing for me. Figmentum has also been selected, and we’ll be playing new pieces by Niloufar Iravani and Kari Besharse, as well as Ania’s Another to Echo, part of our repertoire last season. I’ll post more information her about specific dates and times as they are available. In the meantime, I think I’ll start doing some spotlight posts on clarinet solo pieces by women. This was a blind spot of mine in my training, and I’ve been determined to correct it, and hopefully this will be a resource for other clarinetists and teachers to diversify their own repertoire. 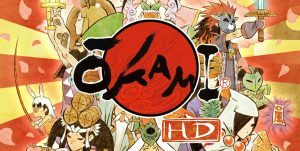 Today, Okami HD releases on the Nintendo Switch, and I am extremely excited. The original is one of my favorite games, and it quite simply has had a more direct effect on my work as a composer than almost anything else outside of music. So I’ve got a new preview version of my hypertext opera Not Quite a Sunset up. You can check it out here. In this version, there is full text and audio through the interlude following the third chapter. If you’ve seen the previous preview version from the 2017 Spring Thing, there have been some significant edits to the first chapter and parts of the second to provide more interaction. As always, this only works properly on computer browsers, but not on mobile platforms. Chrome users – be patient, as Chrome does not always start the audio until you click begin. All other mainstream browsers should work fine. Only one chapter remains. Still a ways to go, and I know better now than to give an estimate for completion, but feeling good about where this is headed. Like many of you, I have been alternately in a state of anger or hopelessness regarding the Trump administration’s zero tolerance policy at the southern border, resulting in thousands of children separated from their parents, and have been wondering what, if anything, I can do to help. Then I saw a post by composer Jen Wang regarding her beautiful plan: for a $100 donation to RAICES, an organization dedicated to providing legal help to immigrants and refugees, she would write a 1-minute piece for the solo instrument of your choice. Since that initial post, she has raised over $5000 for RAICES and 10 other composers have joined her in the project, including myself. It’s that easy! If you can’t donate the full amount, you can donate a smaller amount and join an existing commission. Or you can simply donate and not commission at all! Even if you are not in a position to donate, you can help by sharing the initiative with your own network. Even after the separation policy was ended, there are still families that need to be reunited, and there is a threat that this could just result in families – together with their children – being detained indefinitely. Whatever you do, please find a way that you can help. After a week of work, the new website is transferred from my own shoddy HTML to a WordPress based site, which will hopefully make it easier for me to update more frequently. I’m also going to give this blog thing a try. I’ll be writing periodically about music things, certainly – what I’m writing, playing, or listening to – but also some general posts on anything else, from what I’m reading, games I’m playing, and the like. Hopefully that’s of interest to someone out there.